The cigar industry loves to celebrate anniversaries. This year there are at least three notable benchmarks, each with a celebratory cigar (or four). E.P. Carrillo is celebrating its fifth year. La Flor Dominicana is celebrating twenty years since Litto Gomez started his cigar venture in 1994. But the most anticipated anniversary in 2014 is that of Padrón’s 50th year. In an industry that puts out limited release cigars for virtually any reason, that’s something worth celebrating. 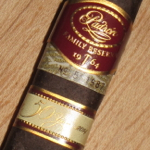 And celebrate Padrón did with two cigars and four blends. In December, the uber-extravagent “The Hammer” will hit stores. That special cigar comes in humidors of 50 individually numbered cigars (either Maduro or Natural) and will sell for over $4,500. (Yes, that’s nearly $100 a cigar.) Buying one of the only 1,000 handsome humidors entitles the owner of it to purchase refills. The less-expensive (though hardly inexpensive, with a MSRP of $25 each) is the Family Reserve No. 50, an extension of the Family Reserve line that started five years ago with the No. 45. Boxes of ten are available with either Maduro or Natural wrappers. The pre-light draw features cedar and chocolate. Once lit, it’s a rich combination of earth and dry chocolate with notes of oak and molasses, and the tiniest bit of pepper spice. Not a ton of variation as the cigar progresses. The powdery, thick smoke creates a finish that lingers. It’s a model of restrained strength with full flavors. And construction is flawless. The cigar is firm to the touch, the draw has the ideal amount of resistance, and the ash holds for as long as I dared to test it. So what’s not to like? Really just the price. A $25 cigar should be excellent, and this hits the mark. Is it much better than the 1926 series? Probably not, but it’s at least a slight step up. Really, the cost is the only thing that would give me pause about buying more. Still, it’s pure Padrón and an all-around standout cigar. It’s easy to give the Padrón Family Reserve No. 50 Maduro the outstanding rating of four and a half stogies out of five. Are the Family Reserve No. 50s (either natural or maduro) readily available, or are these ultra-exclusive as well as expensive? It will have limited availability, but I don't think Padron has said we will only be making ## No. 50 cigars, in the way that they are limited "the Hammer". That said, at least the first shipment seems to be selling out quiclly, especially of the Maduro. Sounds good but considering the price, I'll stick with the Padron 1964 or 1926. The cigar burned exceptionally well with a razor-sharp burn line and this cigar burned from start to finish with a solid white ash.